You are here: Home > News > News > WOW Zone Launch their Global Art Garden! 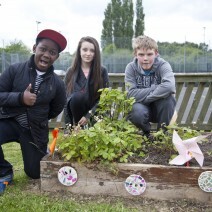 Students from Ringway, St Anthony’s and The Willows Primary Schools in Wythenshawe have just celebrated the launch of their Global Art Garden at Woodhouse Park Lifestyle Centre in Wythenshawe as a culmination of their involvement in a prestigious international learning programme run in association with the New York Mayor’s office. The Global Partners Junior Programme is an exciting project run by the WOW Zone based at Woodhouse Park Lifestyle Centre. It involves students from over 30 global cities meeting weekly to collaborate on a shared curriculum that encourages learners to use technology in a creative way. Students from the WOW Zone have completed over 50 hours of learning based around this year’s central topic of sustainability. During the project they have created animations, presentations, worlds in Minecraft, videos and 3D sketches as part of their work around urban gardens, sustainable buildings and considering their own impact upon the environment. The students have also been able to communicate and collaborate with peers from around the globe including those from Toronto and Sydney via web chat, FaceTime, Skype and letter. The culmination of the project was to decide upon an area within the local community that they could have a positive impact upon. The children wanted to do something that would enable them to be active and as they had enjoyed learning about urban gardens they decided to become involved in revamping the garden attached to the Woodhouse Park Lifestyle Centre where the WOW Zone is based. To finish the project, the children helped to plan the grand opening event to officially launch the garden and celebrate their hard work and achievements. The sun shone and the afternoon was a great success. Children and their families attended and participated in drumming, poetry and arts and craft workshops, as well as enjoying refreshments and great company. The WOW Zone is part of Wythenshawe Community Housing Group’s community investment programme, providing high quality and innovative learning programmes to young people in Wythenshawe.